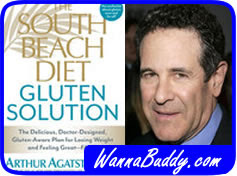 Dr. Agatston originally developed the South Beach Diet to help his cardiac patients lose weight. His diet emphasized rules that were simple, flexible and effective. He has added to his original set of diet rules some new ideas that expand but don’t contradict his original diet. As before, Dr. Agatston suggests focusing on eating a lot of protein and fiber. In fact, try to get one third of your overall daily calorie intake from protein. Vegetables are another focus. He has coined the “stop and go” memory trick. That means that we should eat red and green veggies, but avoid the yellow. Yellow vegetables, in general, have a lot more sugar and starch, so stick with the tomatoes and cucumbers and stay away from the bananas. The new South Beach rules include a focus on “B-based protein.” That means eating beans, bacon (Canadian only, sorry), breast of chicken/turkey and bison or free-range beef. He talks about cattle being either couch potatoes or athletes, saying that we want the athletes (free range cattle) rather than the couch potatoes (grain-fed beef) for our diet. Another tip? Substitute low-sugar condiments for those high-calorie bottles in your fridge. That means using hot sauce instead ketchup, or yogurt instead of sour cream. Lots of flavor with shockingly few calories. Dr. Agatston also recommends eating a dairy-based desert every day. That’s right, he wants you to eat desert EVERY DAY! Woo hoo! Studies have shown that eating a daily serving of dairy can accelerate your weight loss by pounds a week. Plus, it is delicious. Feeling hungry? You shouldn't. Ever. Instead, keep fruits and veggies, or protein snacks at hand constantly so that hunger pangs can be wiped out before they wipe out your diet. Also, never grocery shop when you’re hungry, because your hunger will lead you to make bad decisions. Pretend that the grocery store is closed between 4pm and 7pm every day. You will buy food more responsibly. Everyone on a diet dreams of cheating. Just once, that’s all we want, right? Well, Dr. Agatston suggests that you choose one day a week as your “cheat day” so that you can limit the damage. You spend the rest of the week eating responsibly, dreaming of your next cheat day. Then, when your cheat day arrives, eat your splurge foods responsibly. He eats only three bites of his. Your mileage may vary. Going out to dinner? Try eating a cup of soup or a protein bar before you leave home. That way you won’t be ravenous when your get to the restaurant and you will eat less. The food you choose to order will probably be more healthful, too. After your meal, share a dessert. Give the other person ready access to the plate and make it a bit clumsy for you to take a bite. Bamm! Calories avoided. Most of the new material in Dr. Agatston’s new book is about gluten. He says that gluten sensitivity may be the most under-diagnosed disease in history. This is not referring to celiac disease, he is referring to gluten sensitivity, an allergic reaction to gluten. Eliminating gluten is not easy. Wheat, soy, barley and oats are all gluten-based. Instead, build your starches around quinoa, brown rice, buckwheat (mis-named, I know) and corn meal. You can still build some great flavors without triggering gluten sensitivity. Dr. Agatston believes that gluten sensitivity can cause intestinal inflammation, reduced absorption of nutrients and improper autoimmune responses where your body attacks itself. Following the revised South Beach Diet sounds pretty simple. How has it worked for you?